"The whole thing was just surreal," said Arlandria resident Melissa Garcia, upon hearing the news. "It looked like everything was moving right along and this just came out of nowhere and broadsided us." One of the most frustrating aspects of the implementation of the 2003 Arlandria Plan has been the decade long challenge trying to initiate the few modest investments in the streetscape called for by the plan. As we discussed before, $500,000 were earmarked back then to bring in some basics like better bus stops, crosswalks, trashcans and intersection improvements. A few things happened, even if they were only half measures, but most did not. The most heavily used bus stops can't accommodate shelters (not enough room). There's no place for bike racks. The problems go on. 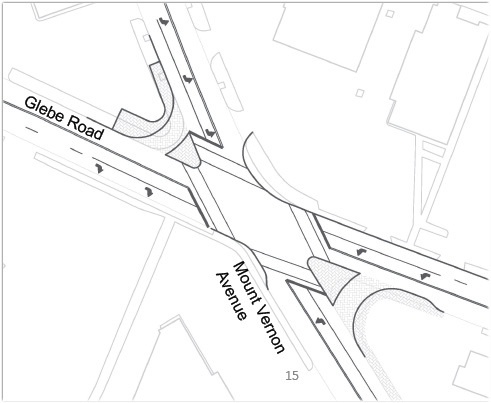 For the last few years, however, the focus of the spending the capital improvement money has been on the intersection of West Glebe Road and Mt Vernon Avenue, a crossing residents have long considered problematic. 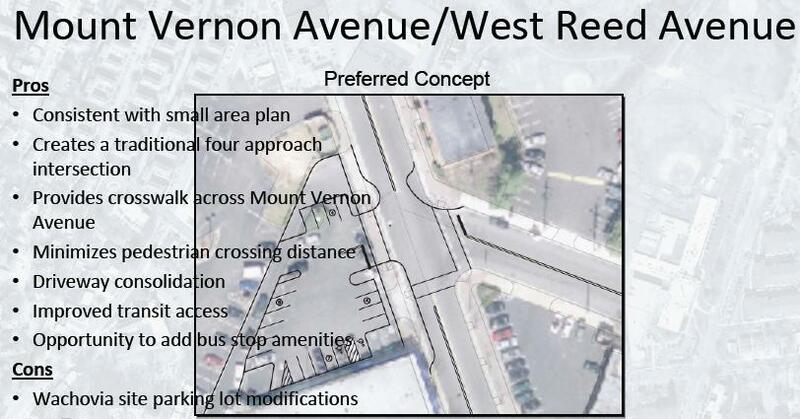 After a good bit of study, the plan for improving this intersection grew to also include a crossing at nearby West Reed Avenue, as both intersections were historically accident-prone. The streets are in such close proximity that the engineers felt the improvements needed to occur in tandem. A year ago, the preliminary costs estimate of improving both intersections came to about $300,000 -- well within the monies alloted in 2003. Neighborhood residents, glad to finally see some utilization of the funds, were heartened at that news and gave these constructive, cost-effective projects their blessing. The momentary euphoria was not to last. Arlandria residents more recently received news that was not so good. 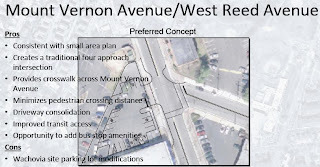 At the January meeting of the Arlandria Plan Implementation Group, City staff informed the neighborhood that the much awaited improvement plan for the West Glebe/Mt Vernon Avenue intersection had come to a screeching halt. What had been vaunted as a well considered plan to...at long last...provide a safer pedestrian crossing, had suddenly been deemed unfeasible. 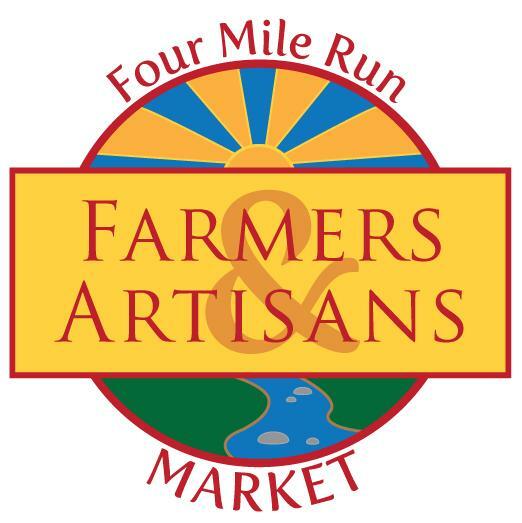 Improvements would have to await redevelop of the surrounding properties --nothing was currently possible without infringing on private property. And what's more, the price tag had also escalated beyond the City's means. The $300,000 that was originally all that was needed to make improvements to both the West Glebe and West Reed intersections, was now necessary to install just the crosswalk at West Reed Avenue. The project, conceived originally as merely a secondary part of a larger, more important holistic enhancement, had instead taken the main stage. The 2003 Capital Improvement Funds - touted as being driving force in Arlandria's revitalization - were now to be spent mostly on a lonely, isolated, and somewhat pathetic (albeit very nice) crosswalk. The prognosis for the West Glebe pedestrian improvements is uncertain. City staff are adament that funds will not be available for such a project for a very long time. Redevelopment of the nearby properties...now a prerequisite for pedestrian safety...is held up in similar uncertainty, with economic feasibility studies showing that construction is not financially viable and property owners complaining that the City government is making unreasonable and inequitable demands. The pedestrian crossing at West Glebe Road might not be dead, but it is in an indefinite coma. Don't bring out the crash cart, it's going to take more than the defibrillator to bring it back to life. so I've been saving it up, I started saving it up. I started giving you up, I started giving you up." April Fool's Day brings about a whole lot of joke headlines. Maybe our double entendre is in a similar vein as those. Or maybe it's really too sad to be funny...even if you were to read it in a comic strip. Security in this place should really improve.